If you are an extreme metal fan you must have marked the day Immortal called it quits with a black circle. Kult black metal fiend or more casual aficionado, this band meant so much for the development of the genre, and later, crossing it over with more defined, riff-oriented, style. I will say this, I am no black metal purist, and I enjoy At the Heart of Winter and Sons of Northern Darkness more than Blizzard Beasts and Pure Holocaust (there, I said it, hope you will continue reading), yet even I can’t help but shudder from the cold frozen twisted feeling Pure Holocaust creates. Would there be anybody who could pick up the fallen mantle? Who would be worthy of the passing of the black lit torch (or rather those horrific spiked weapons Immortal brandished on Sons of Northern Darkness)? When I picked up the promo of I.C.E. Apocalyptic End in White, the last thing in the world I could think of was Immortal resurrection. Not with the image I at first considered silly, not with the indescribable band name (I.C.E. stands for Imperial Crystalline Entombment), not with the song titles resembling Dimmu Borgir’s album titles (three words put together randomly, hinting at Cold and Death in I.C.E. case), not with the first track, Cryogenic Communion, sounding like the creepy voice of Chucky doll from the latest sequel with umbilical cord wrapped around his neck. A week later and at least a dozen listens by now, Immortal and I.C.E. in the same sentence is all I can think about. 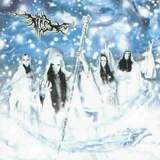 Cryogenic Communion folly aside Apocalyptic End in White is a black metal album that grabbed me instantly and hard, well, just like Immortal albums did way back. If you were thinking slow-down-rock-out Immortal approach of late was deviation from the norm, rejoice. The days of Blizzard Beasts with much better, punched up bottom end production are back on Apocalyptic End in White. I.C.E. manage to channel the ice-hewn hatred, fear and every emotion in between by going MACH 3 supersonic FAST, and they don’t bring a synthesizer/keyboard along. The name of the game is drum speed blasts with occasional rolling double bass, guitars fuzzed out with the barrage of ominous and sinister riffs, tremolo picking and vocals ranging from caustic shrieks to blood-curdling screams, when they don’t do Chucky (Cryogenic Communion and the opening of Hypothermic Possession). Guitars slice through distortion with some thrashy riffs (Hypothermic Possession), but with the speed Demonaz would approve of. I hope these guys don’t develop tendonitis like the Master. Throughout this barrage the band sounds strangely melodic, most of the time covertly, but at times with stunningly beautiful and in-your-face melody (Cascade Cavern Catharsis and Glacial Lyckanthropic Horde). The former melodic riffs are even further propelled with the powerful double bass. The machine gun speed slows down rarely, but strategically, to bring music from afar (Convulsing Frigid Death) or groove out with the hellish apocalyptic march, the high point of Onward Banshee Legions. This song has the best combo of interesting rhythms, cymbals crashed in million shattering pieces and the aforementioned blood-curdling screams. Now, about that image. I stand corrected. What seemed cheesy at first, seemed quite in place towards the end. No corpse paint or spikes, I.C.E. project the image of ice wizards with their robes free-flowing silky white and theatrical masks of faceless expression. These are the servants of Ravaskeith, the god of frozen Arctic cold and beauty, whether invented by I.C.E. or really existing in the pantheon of Northern gods. I can’t tell for sure, as I need to brush up on my mythology. The image is reinforced by lyrics, the vivid description of Ice Age and death from hypothermia. Listening through the album, “getting” the image and lyrics I could not help but wonder how this could have resulted in Waldorf, Maryland, USA, not Oslo or Bergen, Norway. I guess, as long as you feel it, it really does not matter where you come from. The band members, no individual pictures needed as all look one and the same in their attire, maintain the mystique, not divulging much about even who plays what instrument. Through some very secret sources I learned that I.C.E. bandmembers are involved with other bands, and that is all I am going to say. Apocalyptic End in White is the music I recommend you have in your portable CD player (or iPod) when you are stuck with the long walk in cold and dreary weather. Wind chill penetrates every bone of your body, small icicles hit your face as thousand needles. Apocalyptic End in White, no doubt, rapes your ears and senses, but it is also meant to give you a lift. Somewhere I read that people who almost died from hypothermia had very pleasant near-death experiences. Just before they lost conscience the whole warm wave came over their bodies leaving them relaxed and peaceful. As cold as Apocalyptic End in White is, it is also full of life, pulse and booming production. Ravaskeith may still end up taking your soul away, but at least you will have a chance to listen, shudder, rejoice and revel. Immortal is back, if not in body, then, at least, in spirit.